Opening card rudo who seems to be a favorite of the photographers. 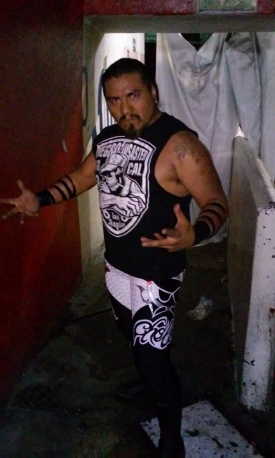 Many have used the name 'Cholo', but this one appears to have started in CMLL in 2008 after wrestling infrequently. Started off as the lowest man on CMLL's totem pole - appearing no more than once a month and losing every single match - before starting to appear more often in 2009 and beyond. Still an opening rudo and probably cast in that role for his career. Missed many months in 2011 due to a knee injury. Obviously has wrestled under a different names previously. Rumored to be Guapo U member Caballero, as seen here. This page was last edited on 1 September 2017, at 05:18.